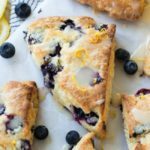 Tender flaky scones that are not only dairy free, but gluten free, too! 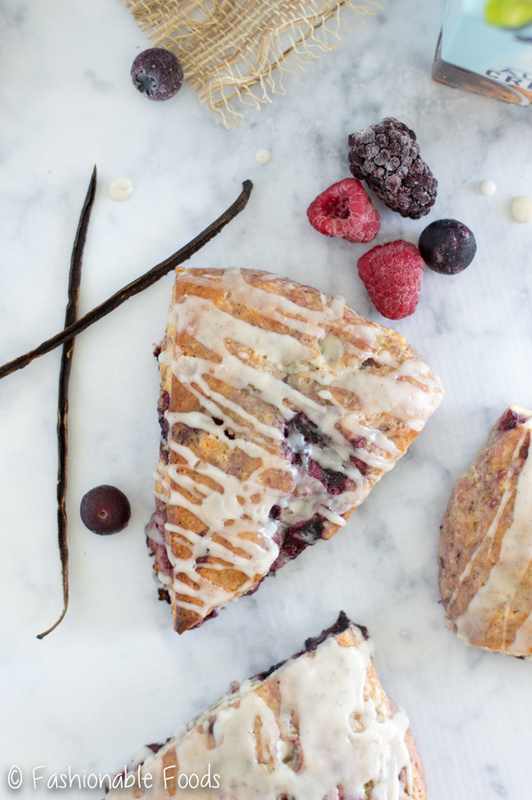 These berry vanilla scones have just the right amount of sweetness and taste buttery… even though there’s no butter! Welcome to a new week, friends! Did you have a nice Easter? It was a blistering summer day here at 86º! We celebrated Easter on Saturday with family at our house. We set up an Easter egg hunt for my 3-year old niece, which was lots of fun! I made ham, au gratin potatoes, roasted (local) asparagus, homemade biscuits with honey butter (recipe coming in the near future! ), and my grandmother’s fresh coconut cake. That coconut cake is a showstopper… a lot of work, but a showstopper nonetheless! Finding fresh coconuts proved to be a challenge around here. I had to go to three different stores and when I finally found them, they were pretty tiny. Instead of the two that I’d typically buy, I went with four just to be safe. I’m glad I did because one of them just refused to open. No matter what we did, that darn little coconut wouldn’t open! Ok enough about that, let’s talk about scones! Dairy free scones to be exact. 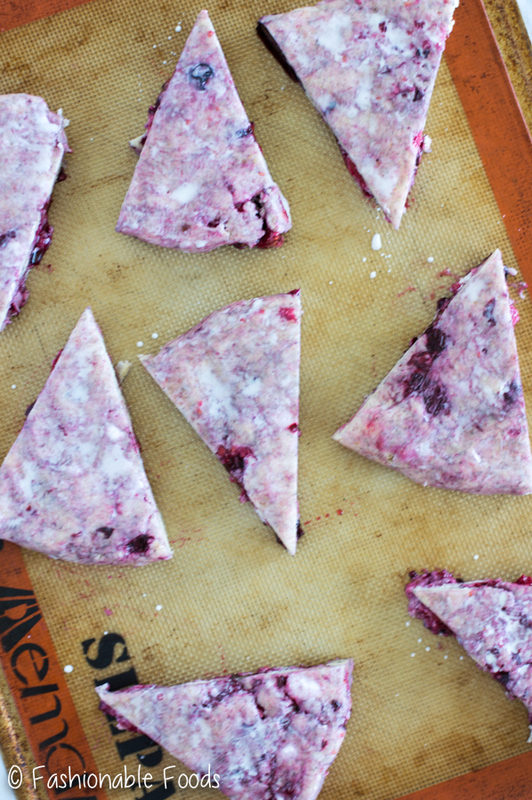 You will absolutely never believe that these scones are dairy free! If you’ve been following me for any length of time, you know my obsession for scones. 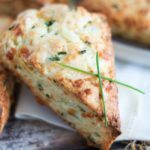 I have around six scone recipes on this blog. They are hands down my favorite treat to make and eat! So, I figured it was about time that a dairy free scone made an appearance. So, how are these made dairy free you ask? Instead of butter we use coconut oil and instead of milk or cream we use almond milk. 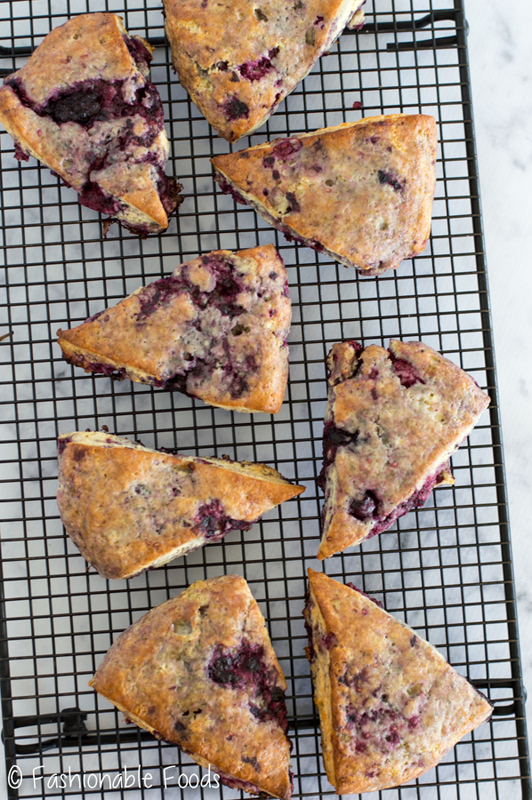 I gotta say, I think I like these better than scones that are made with butter! ? While testing this recipe, I definitely had my doubts on how they would be sans butter, but I actually think the coconut oil makes them even more tender and flaky than butter! My favorite part of any scone is always the glaze. 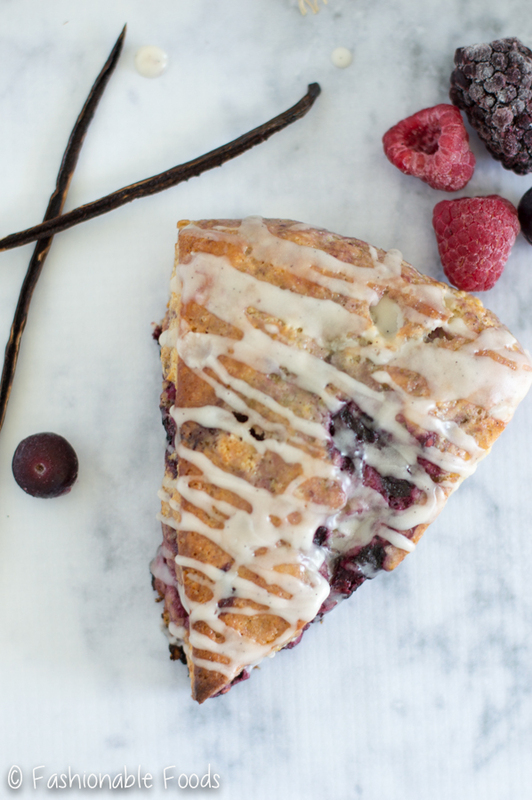 It’s what takes an already delicious scone to an even more delicious scone. And this particular glaze is extra special because it’s made with coffee creamer! 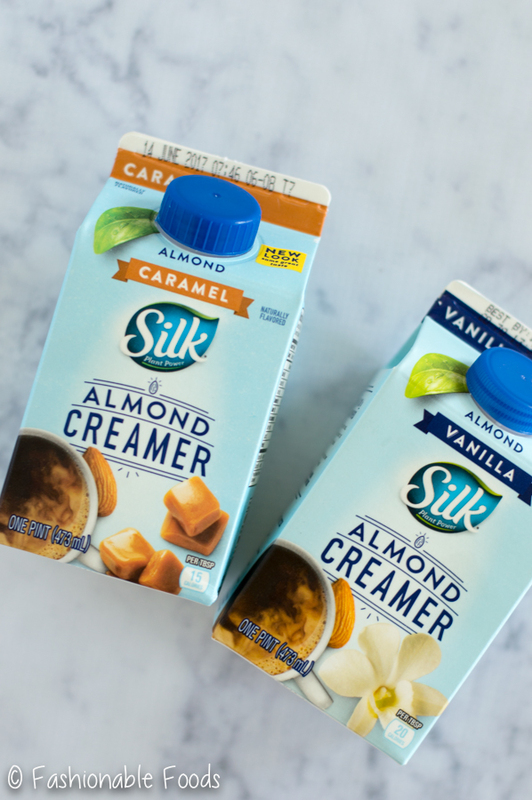 While in Walmart the other day, I grabbed my go-to coffee creamer.. Silk® Vanilla Almond Creamer. I love my coffee in the morning, but I don’t do so well with a dairy/coffee combo. 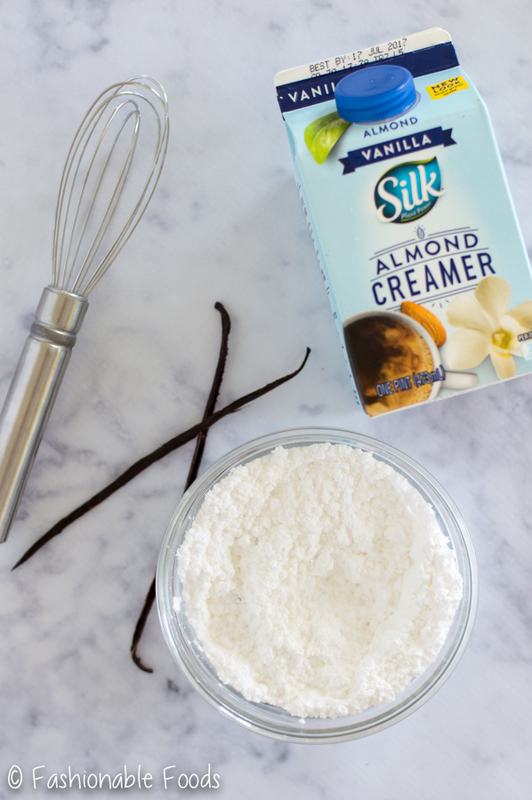 I prefer dairy-free creamers and the Silk® Almond Creamers are simple and delicious with no artificial colors or flavors. I’m a sucker for vanilla, so I tend to always gravitate towards that, but every now and then I like the caramel variety, too! Not only are these creamers dairy free, but they are soy, peanut and gluten free, too! 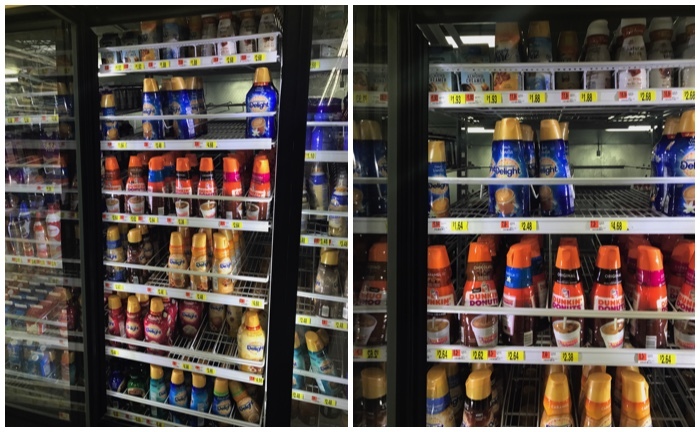 Oh, and there’s no carrageenan either! 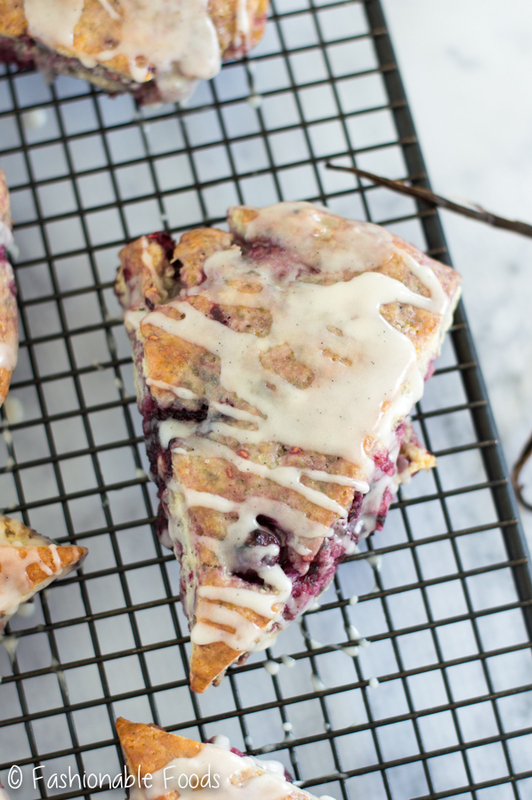 Scones and coffee are a match made in heaven, so why not work some coffee creamer into the scone?! Genius! To really amp up the vanilla flavor in these scones, I added half a vanilla bean as well as some vanilla extract. Then, the glaze consists of the other half of the vanilla bean, Silk® Vanilla Almond Creamer, and powdered sugar. If you don’t want to buy vanilla beans, you can simply just double up on the vanilla extract. I absolutely love vanilla beans, though. Those little specks get me every time! 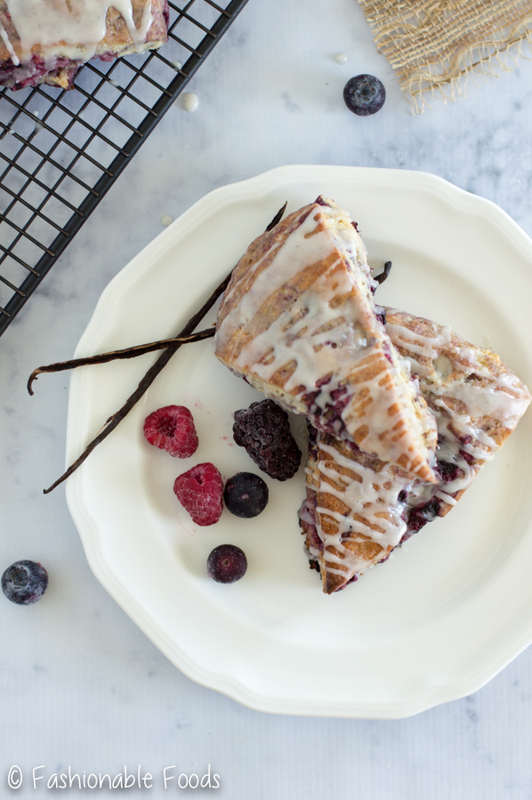 The best way to enjoy these berry vanilla scones (in my opinion of course) is with a hot cup of coffee finished off with a splash of Silk® Vanilla Almond Creamer. What could be better? ? 1 Cup Fresh or Frozen Mixed Berries , if using frozen let them sit on the counter for 10-15 minutes before using. Combine the flour, xanthan gum (if using), sugars, salt, and baking powder in the bowl of a stand mixer fitted with the paddle attachment. Turn the mixer to low to combine the ingredients. 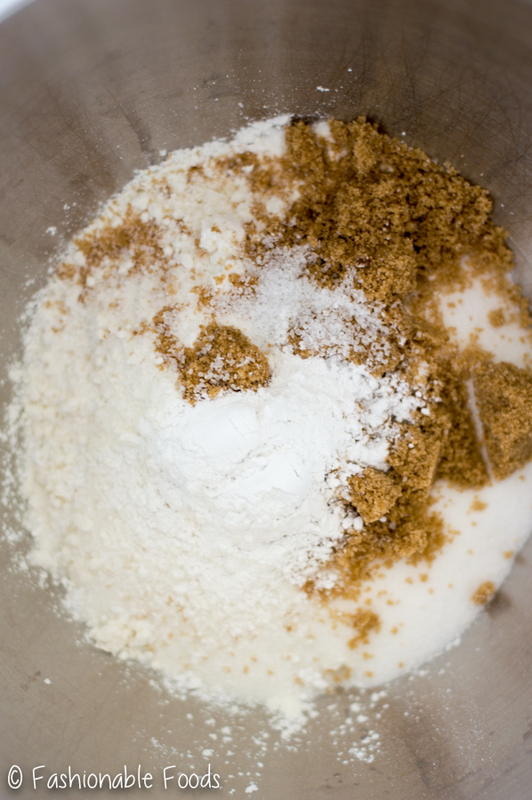 With the mixer running on low, add in the coconut oil and let it run until the coconut oil breaks up and the mixture resembles coarse crumbs. Add in the egg, vanilla beans, vanilla extract, and almond milk. Mix until just combined. The mixture may seem a bit dry at this point, but should come together once you add the berries. 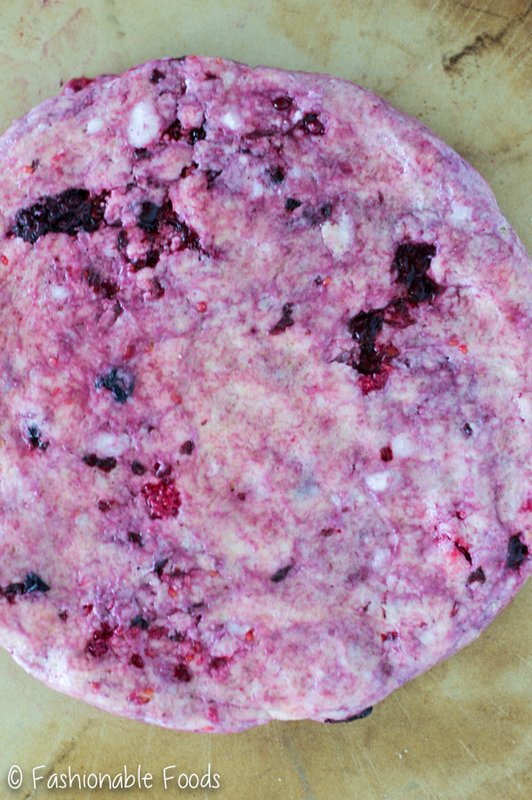 Stir in the berries until evenly distributed throughout the dough. If the mixture is dry and won’t come together, add almond milk (a tablespoon at a time) until it comes together. Pour the dough onto a silpat or parchment covered baking sheet and from into a disk. Press the disk out until the thickness is about an inch or so. Cut into 8 wedges and separate them out on the baking sheet. Place the baking sheet in the freezer while your oven preheats. Brush the scones lightly with almond milk and bake them for 17-20 minutes, or until golden brown around the edges. Let cool for 10 minutes on the baking sheet and then transfer the scones to a cooling wrack to cool completely. Once the scones are completely cool, making the glaze by whisking the cream, vanilla beans, and powdered sugar in a small bowl. Drizzle the glaze generously over the scones and serve. The scones will keep in an airtight container for 4-5 days. *If you aren't gluten-free you can use the same weight in all-purpose flour. *Be sure your gluten-free flour blend is dairy-free! Some use dry milk powder in them, so be sure to check your labels. *You want the coconut oil to be solid, not liquid. If yours is in liquid state, simply refrigerate it until it's solid, but still a little soft. Looking for more info and recipe ideas? Go here and here! Sounds like you had a great Easter, Keri! With some yummy foods, too! 🙂 These scones are calling my name. I love that they’re dairy free and filled with berries. Just what I need for a spring breakfast or dessert. Looks SO good! I’m with you on the scones – I’ve never me one I didn’t like! These look so good and I’ve never thought to make a glaze with coffee creamer. 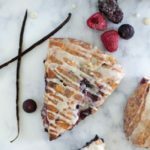 What a great idea for a dairy free recipe! We had roasted local asparagus too!! Isn’t it great to have that back in season?? I love the idea of coffee creamer for the glaze on these…they look delicious! Yes, I just love asparagus season! I ran out today and picked up more – I just can’t get enough. Thanks, Lindsay! Sounds like you had a fabulous Easter, Keri! I mean, egg hunts and a smorgasbord of food sounds like a GREAT holiday if you ask me! I had to laugh at your coconut experience, because I have been there!! Why are coconuts such a PITA?! I swear I always buy three times more than I need, because guaranteed 2 out of 3 I won’t be able to get open. 😉 Anyways, LOVE these scones! I can’t believe these beauties don’t have any butter!! That totally means I can eat at least a dozen in one sitting… because no butter equals healthy. Right? 😉 Can’t wait to try these! Cheers, girlie! Oh yes! I seriously love these more than the butter containing ones! Have a great week, Mary! Was looking for something new to munch and was never disappointing! My relatives are coming over this week, gotta prepare something nice for them and this recipe just made it to my list. Can I make these without the egg? 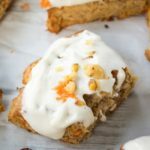 I have a friend with gluten, dairy and egg allergies and these look so yummy! Hi Chris, I always recommend using weight for best results as GF blends can really vary. However, if you don’t have a scale use 2 cups and then evaluate the dough – if it’s wet and too sticky you can add a little more flour to make it easier to work with. Hope this helps!